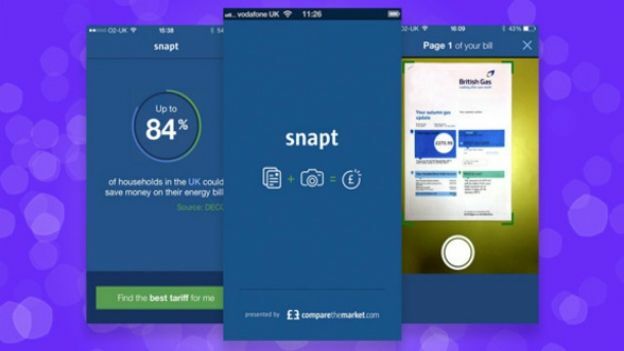 Price comparison site comparethemarket.com has launched Snapt – an iOS app that promises to cut energy bills by doing all the hard work for you. Comparing energy prices and choosing the right provider can be a painstaking process, but Snapt will do all the difficult bits for you. The iOS app prompts you to take a picture of your energy bill so comparethemarket.com can find the best energy tariff, within just 10 minutes. “84% of households aren't changing their energy supplier as they feel the process is too time consuming and confusing. Snapt will make it as easy as possible for people to see how much they can save,” said Benjamin Braun, Head of Customer Experience at comparethemarket.com. The comparison service, known for its successful marketing campaigns featuring Aleksandr the Meerkat, pinpoints your cheapest local alternatives. Snapt boasts the potential to save the UK over £9.2bn on energy bills. Recent figures from the Office of National Statistics show that household expenditure on energy has increased by over 84.5% since 2000 so the app could prove undeniably handy. Snapt is available now and free to download at the App Store.